"Oh no! Not another salad." Do you ever get this kind of response when you start pulling the lettuce out of the fridge? I got it one night as I was making dinner for my husband and I told him that this wouldn't be just any old salad. I quickly scrambled to see what goodies I could throw in. Knowing that my cupboard was well stocked with snacks for my two year old; we ended up topping our salad with Goldfish crackers, Craisins, and Mandarin oranges. The salad was a hit and I vowed never to have a boring salad again. Toppings can make any salad extraordinary. Here is a list of fun toppings to try on your next salad. Toasted nuts are all the rage in fancy restaurant salads. Make a little gourmet magic of your own by tossing some pecans, walnuts, almonds or pine nuts into a skillet and stirring over medium heat until the nuts turn a shade darker and give off an enticing aroma. Berries are wonderful in salads! You'll be surprised at how delicious that touch of tart sweetness is in an otherwise savory salad. 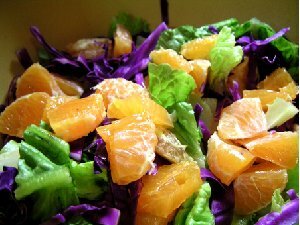 Small cubes of oranges or apples add great flavor to salads. Try a tart granny smith apple with feta cheese and berry vinaigrette. Pass up the cheddar and mozzarella and reach for Romano, feta, Parmesan, spicy pepper jack, and Swiss. Cheese can add a real kick to a salad. Every salad deserves a little crunch. Don't throw away the broken tortilla chips in the bottom of the bag; sprinkle them over salad. Try Goldfish crackers, Wheat Thins, Corn Chips, and even Chinese noodles.